Howdy, Knitters! Welcome back to the Knitting Daddy blog. If you’ve been here before, it’s awfully nice of you to come back and I’m glad that you’re enjoying what you read. If this is your first time reading the blog, I do hope you like it and take some time to look at a few of the previous posts. You might particularly enjoy reading my knitting origin story, as it is directly related to today’s post. I am especially excited about this post, and it will take a departure from the kind of posts I typically write. Instead of giving a wrap-up of podcasts I’ve been enjoying lately (even though there have been a lot of good ones) and talking about what’s been on my needles (which has been pretty cool, too), I’m going to focus on a single topic this time. And that topic is why I’m so excited. I published my first knitting pattern this week! A family of some of preemie hat samples I knitted while designing the Scrappy Sock Yarn Preemie Hat pattern. 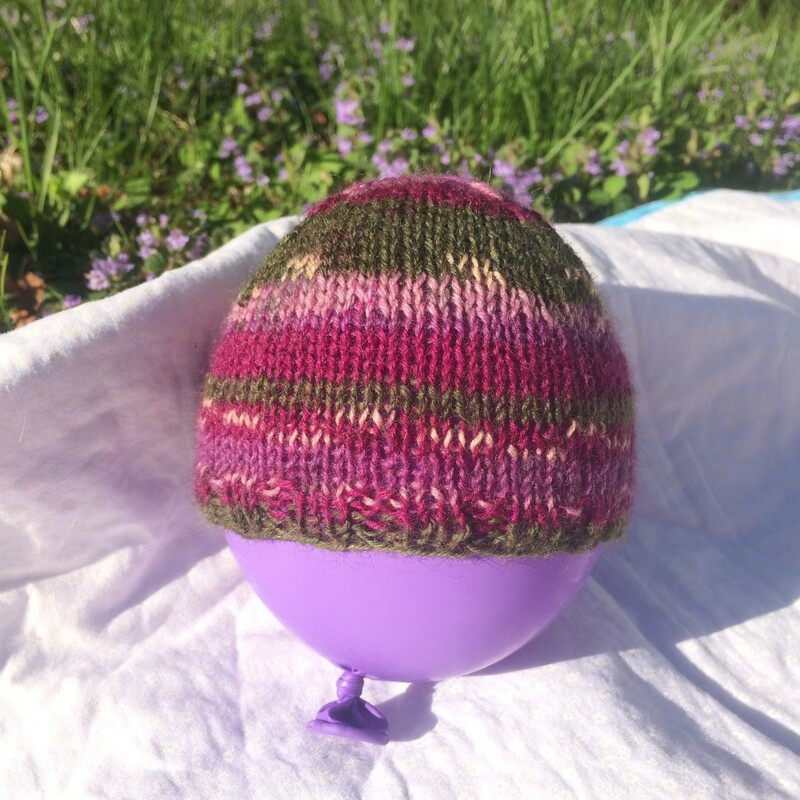 The pattern is “Scrappy Sock Yarn Preemie Hat” and it is available for sale on Ravelry. All proceeds from the pattern sales go to support Family Support of Central Carolina (FSNCC), the non-profit organization that meant so much to my family when my daughter was born prematurely and on whose Executive Board I now serve. The pattern is $3, but you can save $1 by using the coupon code “BLUEBERRY” when you check out (coupon expires 2015/05/31). I’m going to spend the rest of the post talking in detail about the hat and how it came to be, but I’ll go ahead and give an “executive summary” about the pattern itself. The pattern uses sock yarn and is great for bits and pieces you probably have left over in your stash from sock and shawl knitting. There are two versions of the pattern included: a basic stockinette version and a lace heart version. The stockinette version is ideal for a beginner knitter who wants to knit a little project in the round. It’s also great for truly using up the last scrappy bits of sock yarn in your stash if you don’t mind joining in new yarn as you run to the end of your old yarn. The lace heart version is a simple lace pattern. Directions are both written and charted, so anyone can follow it and it is a good introduction to lace knitting. The crown is made with balanced decreases, which creates an effect of arrows pointing to the top. The pattern includes three sizes. The small size will fit a micro-preemie, barely fitting on an orange. The medium size will fit preemies, and is about the size of the first hat I knitted for Blueberry. The large size will fit a larger preemie or a newborn. You can also make larger versions of the hat by using DK weight (or heavier) yarn and larger needles. It’s a great pattern for experimentation! Prior to publishing the pattern, several people test knit it and I’m extremely grateful for their feedback — it helped tremendously in making the pattern more complete. I made this stockinette version of the hat with yarn I had leftover from knitting a pair of socks for my father last year. I love being able to find good uses for my scraps of yarn! Let me tell you about this hat came to be, and why I love it so much. Preemie hats are the reason I am a knitter. When Blueberry was in the NICU, one of the nurses gave us a few hand-knit and hand-crocheted hats for her. It was examining those hats that convinced me I could learn how to knit. 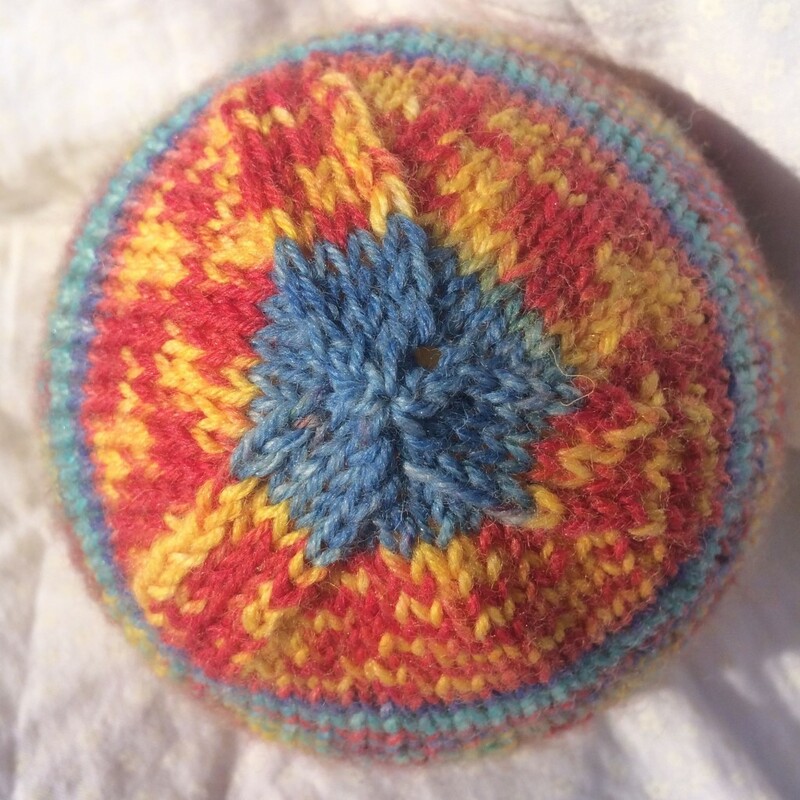 A few days later, I had completed my first project — a preemie hat for her. It barely fit, but it was so sweet to be able to see Blueberry wearing it. I’ve been knitting ever since. 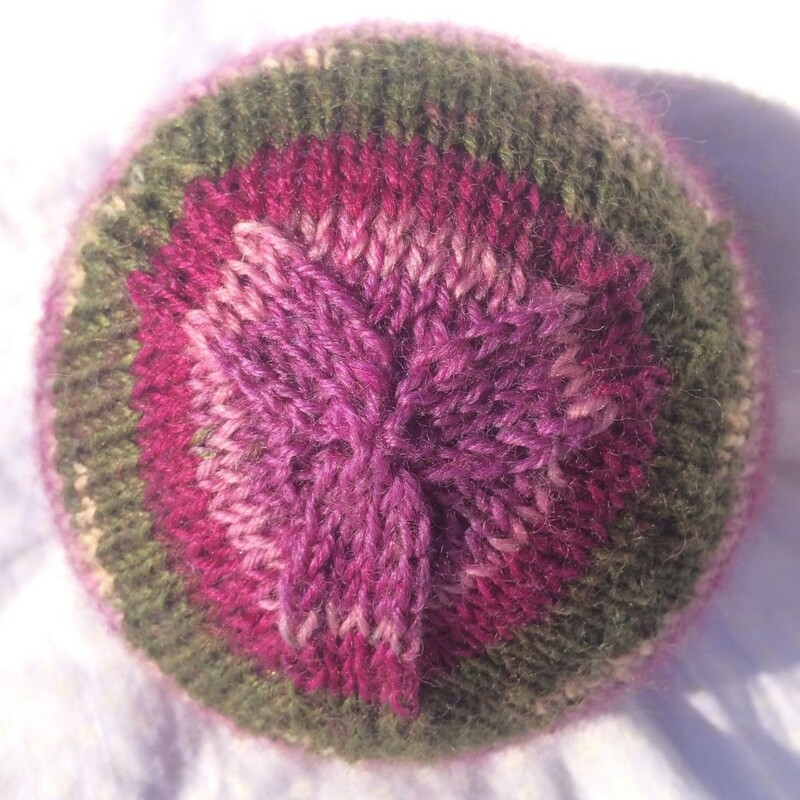 Preemie hats are such a wonderful thing for families with a child in the NICU. For one thing, they’re practical. Premature babies have a difficult time regulating their body temperature — they’re used to mommy’s womb taking care of that. That’s why they’re in isolettes all the time. Wearing a hat helps them. Hospitals have hats, but they’re mass-produced and without character. The handmade preemie hats bring character. They serve the practical purpose of temperature regulation for the baby, but they also introduce an intangible element for the family. They bring hope. They bring joy. It was so sweet for us to see our little daughter wearing a colorful preemie hat, while she was surrounded by hospital machines with tubes and wires everywhere. It reminded us that people cared about the journey we were going through. Last year, I hosted a preemie hat drive to support the Women’s Hospital NICU and FSNCC. Knitters from all over the world donated hundreds of hats. I was blown away and humbled. Looking at all the hats that came in, in so many designs, I wanted to do more. I was inspired to design my own preemie hat. I kicked around all sorts of ideas in my head for a long time. Finally, over the past few months, things started coming together in my mind for the hat I wanted. The first design element I wanted to include in the pattern was the balanced decreases on the crown. All the hats I’ve knitted to this point use decreases with K2TOG every now and then, which creates a decrease effect that kind of leans. It’s really not a big deal, and most people probably don’t even notice it. But I always thought that by combining K2TOG with SSK, like you do on a standard sock toe, you could achieve a crown decrease that is more symmetrical. With some experimentation and feedback from my test knitters, I came up with a crown that I loved. Early prototypes had four sets of decreases, but that really was just too fiddly, and three sets worked much better. The balanced decreases look like arrows pointing to the top of the head. Different yarn produces different patterns as the decreases climb up the hat. My first hats were all stockinette. After ironing out the basic details, I wanted to include a version that had a little flair. I decided that a lace heart would be pretty awesome. 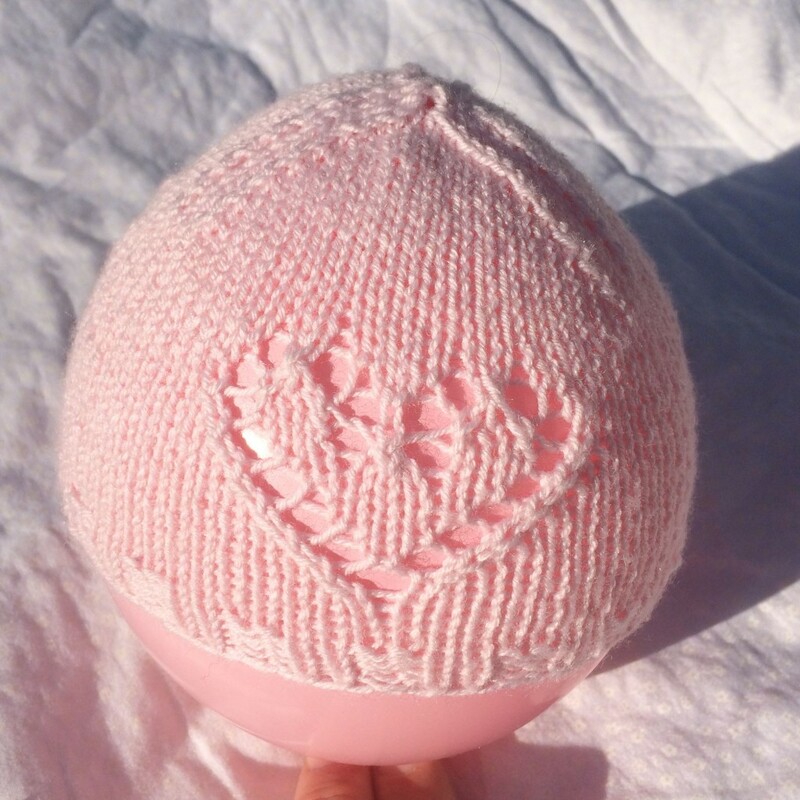 I was able to fit a lace heart design centered under the balanced decreases, so the lace heart version has three hearts spaced along the body of the hat. Of course, if you only want one heart, you can leave two of them off, but I liked having the motif run around the entire hat. 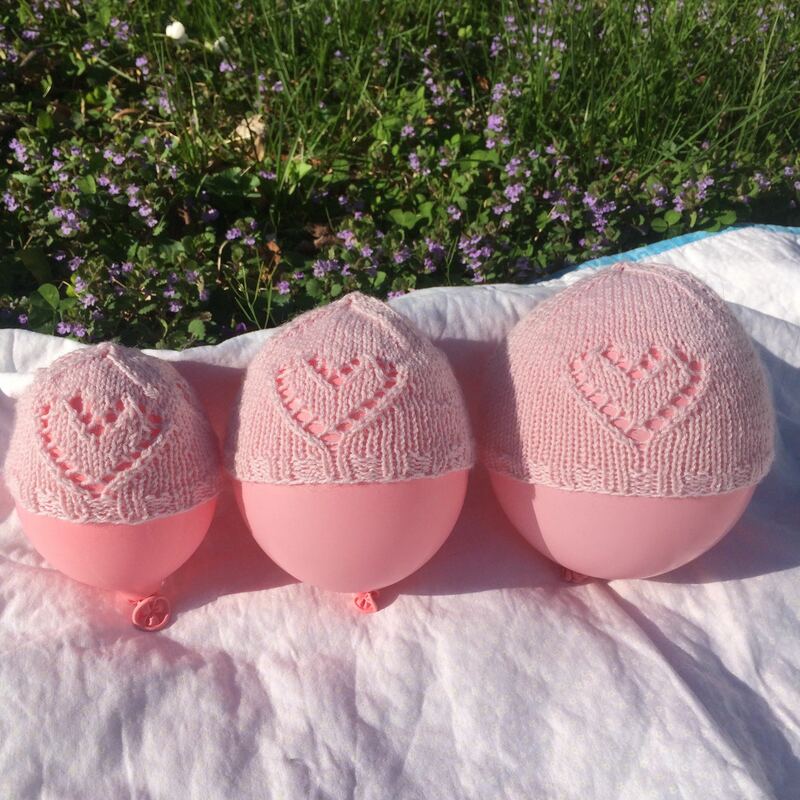 All three sizes of the Scrappy Sock Yarn Preemie Hat, in the lace hearts version. The small will fit a micro-preemie, the medium a preemie, and the large a large preemie or newborn. The heart motif adds a touch of flair and is repeated three times around the body of the hat. I knitted about a dozen hats and many of my test knitters ended up knitting multiple hats as well. 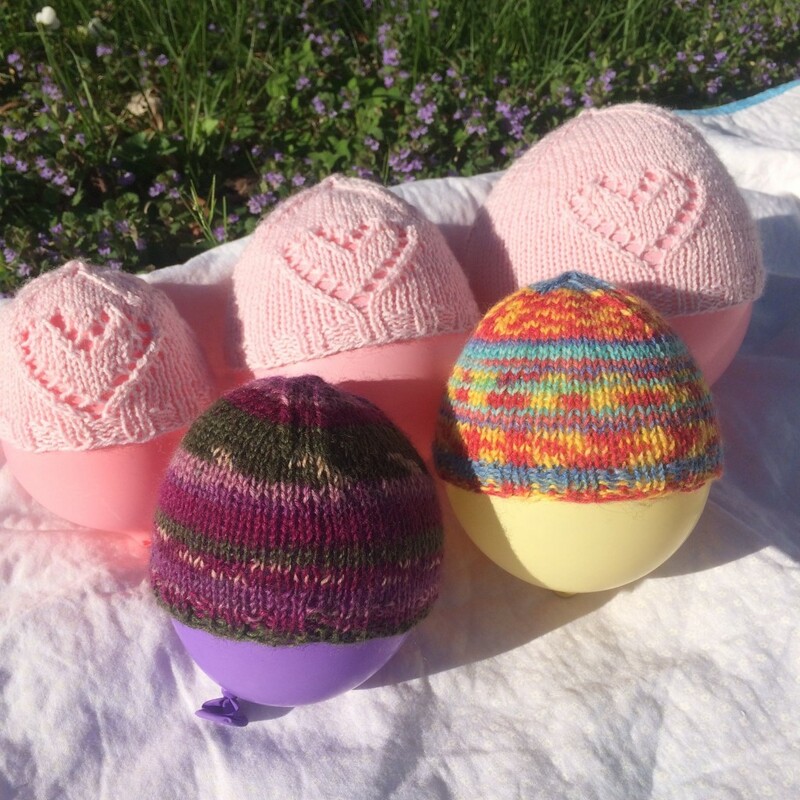 In addition to getting feedback from knitters, I showed the hats to my friends who work in the NICU for their feedback, to make sure the hats would be appropriate. They loved them, too. I am absolutely thrilled with how it all came out. If you’ve knitted preemie hats and donated them to the NICU, thank you so much. They really do bring joy to the families who have babies there. If you’re looking to do some charity knitting, preemie hats are great. Because they’re so small, they knit up very quickly. There are lots of patterns available (many free) on Ravelry, in all sorts of yarn weights. Please consider making some preemie hats and donating them to your local NICU. Check with your NICU for any requirements they might have (fiber content, etc.) for donations they accept. Generally, the hat should have a stretchy brim so that it will be easy to get on and off and it should be made of machine-washable yarn. If you’ve got extra sock yarn hanging out that would look awesome on a little baby’s head, I’d be honored if you knitted the Scrappy Sock Yarn Preemie Hat. Remember, all proceeds from the pattern sales go to support Family Support of Central Carolina (FSNCC). If you’d like to support FSNCC directly, please visit the “donate” page on their website. I recently finished knitting the socks I cast on Christmas Day. I made this preemie hat with some of the leftover yarn. 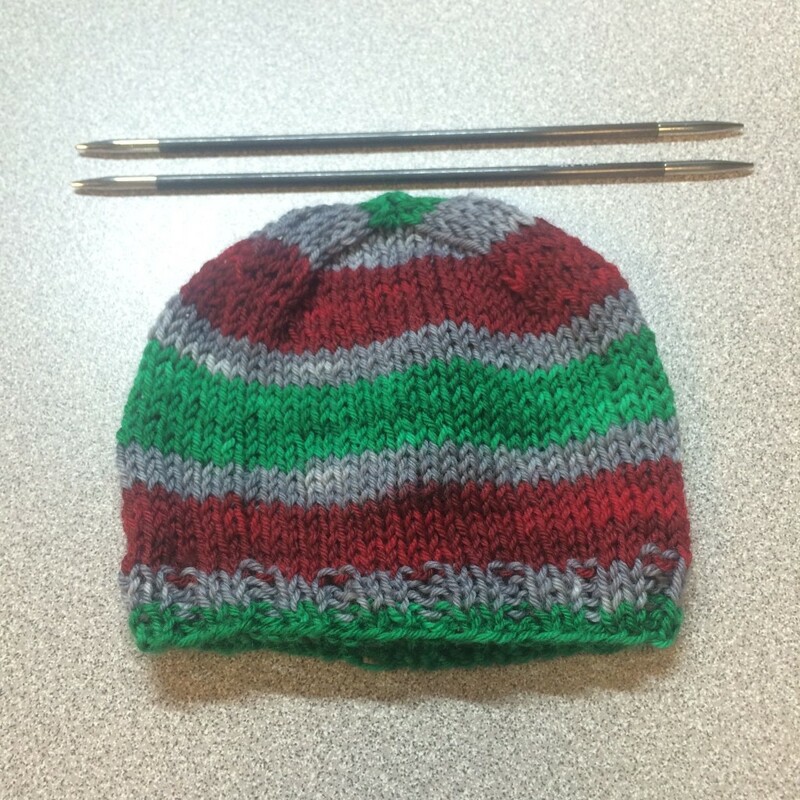 It’s a size medium, and those are 6″ knitting needles for size reference. I would absolutely love to hear stories about preemie hats you’ve knitted. You can share your story in the comments here, or by visiting the “Knitting Daddy Designs” group on Ravelry, where I’ve started a thread to share stories about preemie hat knitting.